Could Tourism Help Save The Great Barrier Reef? Australia's tourism industry on the Great Barrier Reef is thriving, with new hotels and resorts opening along the coast all the time. 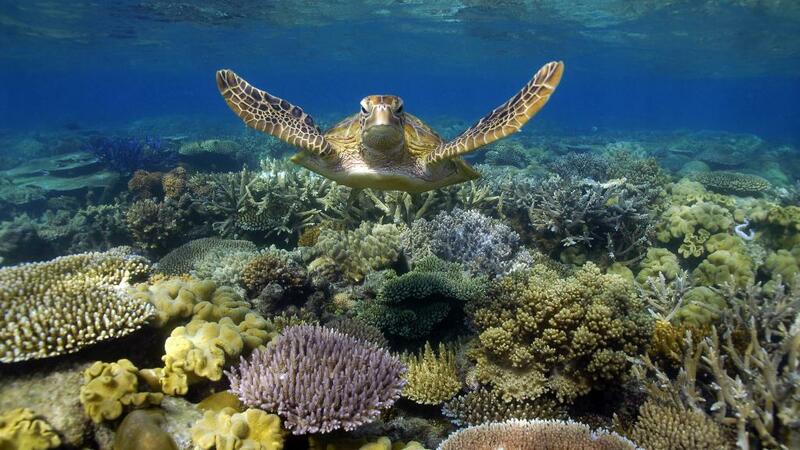 One of the most fragile ecosystems in the world, concerns have been raised that perhaps tourism is doing the reef harm. However tourism is far from the biggest threat for this natural wonder. In fact, it's actually helping to save it. A visit to the Great Barrier Reef is an exercise in mother nature showing off in all her beautiful weirdness, but it's a slow reveal and that's part of its charm. Arriving in one of the reef gateway towns like Cairns of Townsville, there's not actually much to see in terms of the reef. It's not until you take the trip out onto the water that you truly start to appreciate what this incredible natural attraction has in store. There's plenty of Great Barrier Reef accommodation to choose from, but those who want the quickest and easiest access to the reef generally stay on one of the Whitsunday Islands. Most resorts are doing their bit to minimise their environmental impact but of course some do it better than others. A good preliminary stop is Reef HQ, the government-run Great Barrier Reef aquarium where you can get familiar with some of the cast of characters you'll find on the reef. Since the 70s, the reef has been a government run marine park meaning the industry is actually quite heavily regulated. Visitors must pay an environmental management fee, the number of visitors to snorkelling and diving sites is regulated and instructors have been educated to ensure there is minimal contact between the precious coral and curious visitors. Almost 85 per cent of tourists are channelled into the Whitsunday Islands, meaning the rest of the reef remains virtually untouched. Although travellers bring in approximately $2.9 billion to the northeastern economy, a recent survey of conservationists and scientists revealed that tourism wasn't even ranked in the top five threats to the reef. The islands showcase just how much beauty this region has to offer both above and below the water. Lizard Island is predominantly national park but a single resort sits on the edge of the island surrounded by green mountains and aquamarine sea. One of only a few resorts situated on the Great Barrier Reef itself, Lizard Island offers the shortest ride to one the most famous dive sites in the world. The resort is the epitome of discreet, environmentally conscious luxury and is self-sufficient for both electricity and water thanks to generators hidden behind the resort. Closer to the coast and further to the south, Orpheus Island is not actually on the reef itself but is surrounded by smaller, stand-alone fringing coral reefs which are still exceptionally spectacular to explore. The resort here will only ever host a maximum of 28 guests at a time, so service is always personal, attentive and prompt. The rooms are simply a place to sleep and freshen up, with the expectation that guests will be too busy soaking up the spectacular environment to spend time in their room. The resort is perfectly set up for this with a huge infinity pool where at any given time of the day you can see bait fish as they leap out of the ocean. Spend some time out on the jetty listening to the gentle splash of the barramundi or sink into one of the plentiful hammocks dotted around the place and watch the osprey eagles soar up above. Head further south again and you'll find one of the more popular island resorts - Hayman Island. Hayman is a luxurious property that is focussed on providing a relaxing holiday in paradise, with the reef secondary to that. What appear to be pearly white beaches on closer inspection reveal a sprinkling of colourful crushed shells like the toppings on a sundae. The lush rainforest that surrounds the resort obscures the buildings, blending them in to the natural environment and is kept green with recycled water in a nod to their environmental conscience. If you look carefully as you stroll along the beach, you might just see the small scaly head of a sea turtle bobbing out of the water. The Great Barrier Reef is home to six out of seven of the world's turtle varieties including the marine flat back, which can't be found anywhere else in the world. It's these glimpses into the true miracle of nature that reminds us why protecting this wonder of the world is so important. The trauma, both natural and man-made, inflicted on the marine life and their homes is a reality check for all. If we want our children and our children's children to be able to experience the magic of these irreplaceable ecosystems we must take care. While tourism used to be part of the problem, it's now part of the solution. No longer to boats scrape the shallow seabed and never again shall visitors be permitted to tramp over the coral. Now, a trip to the reef is an educational experience and a deeply moving one at that. The fragile beauty of this World Heritage listed treasure inevitably converts visitors into environmental crusaders, ready to share the truth and beauty of a sustainable future long after they've dusted the sand off their shoes.